Review: Is the Yuneec Breeze Really the ‘Ultimate Flying Camera’? In this day and age, technology is constantly evolving before our eyes. Companies are not only competing against each other but seeing how to renovate and improve their latest items. From what it looks like, tiny and portable seems to be the goal for most items being released which catches the attention for many consumers. When Yuneec came out with their compact and portable drone, Breeze, it was known as the ultimate flying camera. According to Yuneec’s CEO, Tian Yu, the company wanted to take selfies to another level – no pun intended – allowing people to take unforgettable moments through incredible photos and videos. With many compact drones being released, the Yuneec Breeze definitely has some competition. The $500 drone might have pleased the consumers with its size but do its features make it worth the money? If it has not been emphasized, the Breeze is compact – making it desirable. People can bring it anywhere without having to leave other items or gear behind. The propellers fold while extra props and landing gear all pop off the body and fold up, which makes the Breeze to fit easily inside a backpack. As for the material, the drone is made of plastic like most drones. The feel of the Breeze might leave you skeptical when you take it out the box as it does not feel as sturdy as you would think, especially for the price. But surprisingly, you don’t need to worry about it breaking as quickly as you would think. Of course, that does not mean you shouldn’t care for the drone. Aside from the build, the Breeze comes with hinged props that also help keep the body from being damaged. This allows any object to be pushed slightly back so it does not touch the body or the propellers. The Breeze might be smaller than the Yuneec Typhoon H and the Typhoon Q500 4K but don’t let its size fool you. The compact drone still has many of the features the bigger drones have. The most impressive and important feature of the Breeze is its 4K camera as it shoots 30 frames per second with 13 megapixel still shots. The one drawback of the camera is its lack of stability. The Breeze does not have a gimbal. Yuneec decided to go with a digital stabilization to keep the body compact but this leads to footage being shaky when shooting in 4K. The digital stabilization only works when shooting at a lower resolution, either 1080 or 720p. Yuneec installed flight limitations in the Breeze that makes its standards a bit lower in comparison to its competition. The drone flies at roughly 11 miles per hour, ascends at 2 miles per hour, and has a maximum range of 0.06 miles. The reason for these limitations is to reduce the risk of damaging or losing the drone as you fly it. When it comes to flying indoors, the Breeze has an indoor positioning system that allows the drone to fly and maintain stability. But even though it has this system for indoors, the Breeze does lack in obstacle avoidance since it does not have the system built in. This means you will have to be aware when it comes to flying outdoors. Even if you need to be wary of where your drone is flying, the flight modes do help. The Breeze also has a fair amount of auto filming modes, like Orbit, Follow Me, and Selfie, which can help the drone stay clear from anything that can possibly damage it. Since most of the flight modes are designed to capture the perfect selfie, the Breeze usually focuses on the person or object that it is trying to take a photo or video of. So you won’t need to worry much when giving control to Yuneec’s autopilot software since this is where the drone will most likely perform best. Another factor that Yuneec decided to take out to keep the Breeze as compact and portable as possible was a physical controller. In order to control the drone, you would need to download the piloting app on your smartphone. Although the app is reliable, it does not compare when it comes to the precision of piloting a drone. A virtual joystick does not do the same job as a physical one. With a fully charged battery, the Breeze can hover in place for almost 12 minutes and when it is actually flying with a full battery, it lasts just about 11 minutes. Depending on the flying activity determines the longevity of the battery. 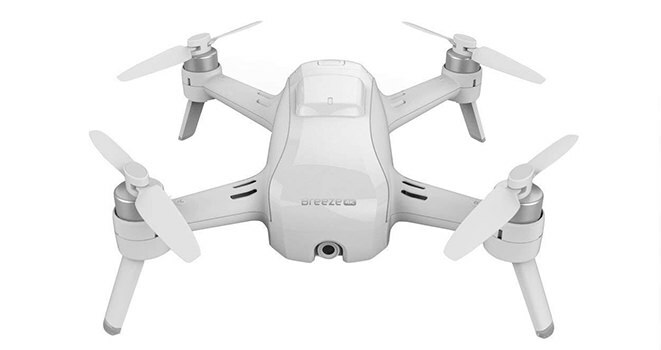 Unfortunately, the battery life is not that long but luckily, the drone package comes with two batteries when you first purchase it. The Yuneec Breeze is perfect for anyone looking to capture aerial shots in a simple, easy, and affordable manner. It has a great quality camera to document but for those who are filmmakers and serious pilots, the Breeze might not give you the content you crave. This is mainly due to its lack of stability – you will either have to compromise high-quality videos or have shaky content. All in all, if you are looking to have fun with a drone, the Breeze is the perfect choice for you.